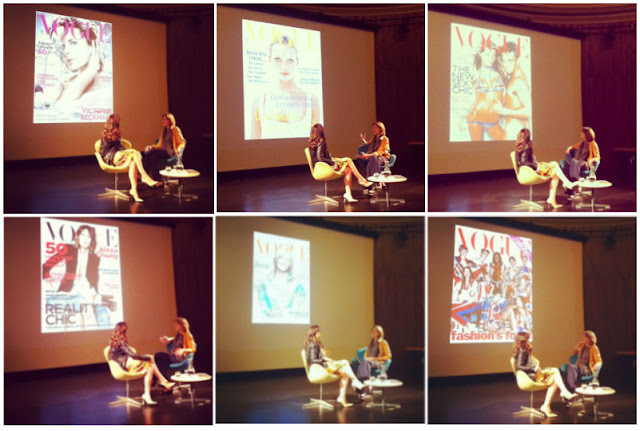 Last Friday evening I was lucky enough to attend an Evening with Alexandra Shulman at the V&A with my fashion pal, Style and Then Some's Katie Wright. Held in the V&A's impressive domed Lydia and Manfred Gorvy lecture theatre, the venue for the event was equally as imposing as the British Vogue editor's journalistic credentials. However, if members of the audience had come to the talk expecting to find a Meryl Streep in The Devil Wears Prada type-character in the British Vogue editor, I suspect they would have gone away dissapointed. Shulman's public persona is about as far removed from the traditional stereotype of a Vogue editor as I can imagine; a quality which continues to make her enduringly fascinating twenty years on from the date she inherited Britain's fashion bible. 'God, what am I going to wear??' Shulman told interviewer Francine Stock was her first thought when she found out she'd got the coveted job of editing British Vogue. Talking through her most memorable covers from her career at the magazine, Schulman shared several of Kate Moss because not only is she beautiful but 'Vogue sells when Kate is on the cover'. The evolution of the celebrity clothes horse was apparent through Shulman's choices, with the 'trashy/perfect' Robbie and contraversial Victoria Beckham covers selling well, 'I think I had the last laugh putting Victoria on the cover now that she has become a successful designer own right' Alexandra told the audience. Putting a Marks and Spencer shirt on the cover of the May '96 issue also proved to be controversial cover for Shulman, as some believed the magazine should only be synonymous with luxury fashion. Shulman also discussed the Princess Diana commerative issue with whom Vogue shared 'a real relationship' with. Alexandra also took the time to answer the audience's questions on a variety of subjects from the possibility of Vogue moving into e-commerce to her desert island luxury! Continue reading after the cut for the Q & A responses..
Q. When do you think we will see the return of models to the cover of fashion magazines? You’re going to see the return of models on cover of British Vogue next year probably because I’ve decided to shoot more model covers again. When I inherited Vogue supermodels were absolutely at their peak and there were only 6 girls that Vogue could put on the cover- the kind of power they had was impossible. There was a collective decision made that we had to be able to deal with more people because everyone was just competing over the same 5 or 6 girls and it wasn’t working. It was into that situation that a new generation of young actresses were born who were interested in clothes and were built into ‘clothes horses’ to some extent. So then you had the actresses taking over and now I think it would be quite interesting to look again at the models. What’s hard is that there aren’t that many recognizable models and you might say to me that it’s my job to make them recognizable but one magazine alone does not a recognizable face make. We need there to be a collective approach. Q. How do you become a Vogue journalist? Quite often journalists come from work experience some years previously and then they make a re-connection and come back to us. We also have a few contracted writers who we use to do quite a lot of the big pieces, but smaller things we commission and build from outside. Q. In this intense market of international competition, where do you see Vogue heading in the next 10 years or so? Are you going to target a new reader? A. I see it having a lot of digital outreach in different ways. I’m absolutely confident there will still be a Vogue that you can hold in ten years time, but if I had to put money on it I would think it would probably become more expensive and probably sell slightly fewer copies. I think we will be developing other things via the digital platform, and doing more events like our first Vogue festival which we hosted last year. We may do some kind of e-commerce, but there are no plans for that at the moment. Q. What types of conversations happen between the international Vogues? And how would you describe your approach to Vogue in comparison to Vogue Italia for example? In my office I have a wall where I put all of the different Vogues on a shelf, and you can pretty much tell by looking at the cover, which country is which, because they’re so defined by a broad aesthetic. French Vogue looks very Parisian and American Vogue looks very clean and ‘a nice version’ of the way people should look! German Vogue often has a blonde wearing quite a lot of black on the cover. We have a Vogue editors conference every 3 years and the editor of German Vogue and I were all talking about the differences between our Vogues. We were asking the question ‘what would your reader spend their money on if they received a huge pay rise?’ and she said in Germany a woman would buy a car! I think I said that in England we would put it towards the mortgage! Q. What would your luxury be if you were on Radio 4’s Desert Island Discs? A. I long to do Desert Island Discs! I think my luxury might have to be some kind of mosquito repellent, but if that’s too practical it would be an Ipod. Q. How defined do you consider the stereotypes of national fashion to be? A. Fashion has become very global. On one level it’s such an international business and British designers have to sell in other markets, which has changed to some extent the way people design. Although you do go to New York and see this sportswear feel that you don’t see in London, and the skills British designers have with fabric and print is still unusual and quite defining. I do think national characteristics still exist in fashion but they’re completely watered down; they’re not as defined as they used to be. Q. You mentioned earlier that Vogue isn’t going to go down the e-commerce route, but I wondered do you feel that you are competing with the likes of Net-a-porter and mywardrobe.? It’s a good question and I’m not saying we’re not going to go down e-commerce, I’m sure we will ultimately but we aren’t at the moment. One of the reasons for that is because we do magazines really well but we’re not necessarily going to be excellent retailers. With all due respect to the retail magazines, they aren’t as good as proper magazines. It seems a bit pointless to me- if you’re great at selling clothes, why don’t you stick to selling clothes, why do you want to have a magazine? There are enough magazines around!